Mass transit advocates hope for a boost from the 350 feet of Interstate 85 that came crashing down in Atlanta, Ga. on March, 30. ATLANTA – The collapse of an interstate in the heart of Atlanta has more than two million metro residents sitting in even more traffic in the already congested city, and mass transit advocates hope the headaches will spur new interest in expanding rail and bus routes. Many commuters come from surrounding countries that have long resisted mass transit, creating a car-centric region shapped by issue of race and class for more than four decades. 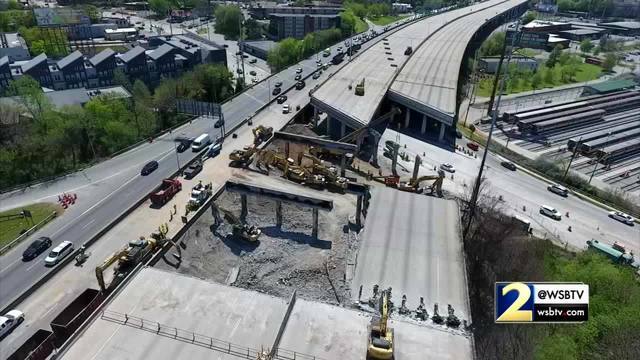 Georgia transportation officials hope to reopen Interstate 85 by mid-June after a 350- foot span came crashing down March 30 amid intense heat from a fire set beneath the roadway. Until then, 250,000 drivers who depend on that route each day are stretching the limits of Atlanta’s other highways and surface roads, or using the region’s transit system at unprecedented levels. Ridership has gone up 20 percent since the collapse. Skeptics of expanding mass transportation in metro Atlanta wonder whether residents of such a sprawling region will leave their cars behind barring a crisis of this magnitude. Georgia lawmakers created the Metropolitan Atlanta Rapid Transit Authority in 1965, envisioning a system to serve the countried that made up metro Atlanta at the time. But three of five counties backed out of MARTA in referendums before its 1971 startup. On the heels of the civil rights movement, white Atlantans were fleeing to the suburbs in droves and had no interest in closing the distance between their new homes and the city’s core. Long after MARTA began operating, Bayor said, whites would privately joke that its nickname stood for “Moving Africans Rapidly Through Atlanta.” Publicly, opponents were less explicit but warned that mass transit would increase crime or diminish property values in the suburbs. Violent crimes haven’t helped MARTA’s reputation. On Thursday, a man was fatally shot on a MARTA train and three passengers were wounded in what police called a “targeted, isolated incident.” MARTA police have investigated four other killings since July, The Atlanta Journal-Constitution reported. There were no slayings in the previous four years, though several dozen aggravated assaults and robberies were reported each year. The transit system is largely limited to Atlanta’s core that doesn’t give most commuters a practical route between home and work. Ted Johnson typically drives 45 minutes from his suburban home to his downtown office, a trip that takes twice as long using mass transit. He doesn’t mind using the train to avoid the collapse issues, but he’s not sure MARTA will be a good fit when everything is back to normal. In a 2011 study comparing mass transit in the largest U.S. metropolitan areas, the Brookings Institution found only 38 percent of metro Atlanta’s working-age population lives in neighborhoods with access to public transportation. Even those living near bus stops and train stations could reach on average only 21 percent of metro Atlanta jobs within 90 minutes. But attitudes toward the Atlanta transit system have changed dramatically in recent years. Decades-old claims that transit would lead to crime and blight “have been proven inaccurate,” said Tad Leit-head, the former head of a regional planning organization. “I’m hoping the people who are using MARTA maybe for the first time will see how convenient it is and stay with it,” he said. Mercedes-Benz and State Farm are building headquarters in Sandy Springs, citing access to two rail stations in the suburban city north of Atlanta. Mayor Rusty Paul, a vocal supporter of transit expansion, said opponents feel like transit is a concession to become an urban center rather than a suburb. “To which I say: Whether you like it or not, the character of this area is going to change because the people are still coming,” he said. Voters created the city, now home to 83,000 people, 11 years ago. Fenced subdivisions and an occasional golf course are connected by multi-lane roads, lined with chain stores and restaurants. Mayor Mike Bodker said he thinks residents could support higher sales taxes for some type of transit but local benefits have to be clear. Opponents of expanding rail lines also argue that it’s too costly. Toll lanes for buses, ride-hailing services and carpooling are a better fix than rail lines that will take years to build, said Benita Dodd, vice president of the conservative Georgia Public Policy Foundation. “Nothing is going to work for us as effectively as the automobile,” Dodd said.